Poster with red and black print on white paper. 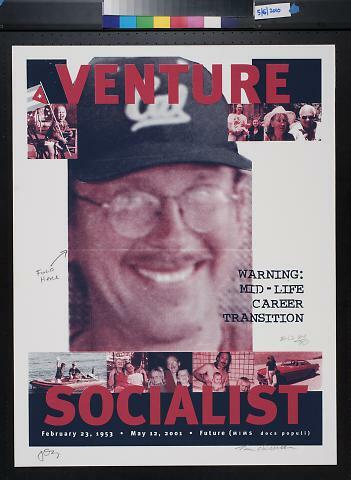 Center image of poster is a close up of a man with eyeglasses and a baseball cap on. Handwritten in pencil next to the image with an arrow pointing to a line in the image is "fold here." To the right of the image is "Warning: Mid-life career transition" with ED H/70" handwritten in pencil next to it. Top of poster has "venture" across it and three family snapshots including one of a small child holding the Cuban flag. Bottom of the poster has five family snapshots and the text "socialist / February 23, 1953 - May 12, 2001 - future (Mims docs populi). Bottom of poster is signed in pencil.